Indiana Jones and the Lost Cafe at Borders! As Indiana Jones wraps up a class he is teaching at Marshall College, his friend and colleague Marcus Brody approaches him. Marcus: I see you’re back none the worse for wear, Indiana. I hear your latest escapade is being referred to as Indiana Jones and the Lost Car Keys of Murray Blitzstein. 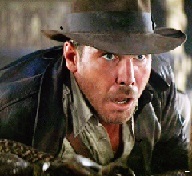 Indy: Yes, Marcus, the keys had been missing for almost three days. The Nazis were already there at Blitzstein’s home jumping at the chance to steal a Studebaker from a member of the Jewish faith, and I had to tangle with Belloq in the kitchen and the hall bath to find them. 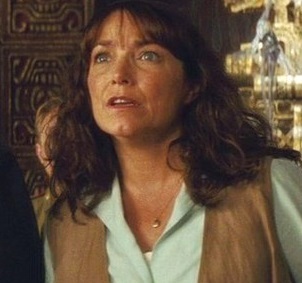 Marcus: How did you locate the keys, Indy? Indy: In the morning rays of the sun at precisely 5:42 A.M., I saw the glint of the keys in the left back pocket of Blitzstein’s seersucker suit pants. He had accidentally placed them there, normally being a front right pocket man. Marcus: Brilliant, as usual, Indiana. Did you restore the keys to Mr. Blitzstein? 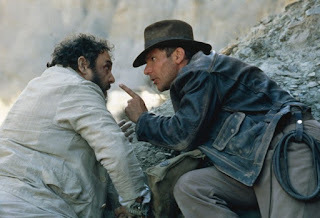 Indy: No, Marcus, the Lost Car Keys of Murray Blitzstein belong in a museum. Blitzstein will have to buy himself an Edsel. Marcus: Indy, there’s another important matter I need to discuss with you. Have you ever heard of Borders? Indy: Indeed. It was a book store, a chain of book stores, which proliferated in North America prior to the rise of the Amazons. The fossil record is unclear, but we believe they were destroyed either by a natural catastrophe, climate change, or some woman named E.L. James. Marcus: That's right, Indiana. 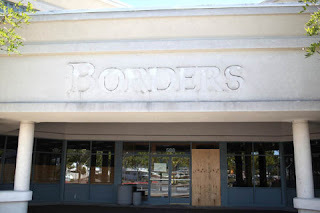 And what we have learned is that inside each Borders was a hidden sanctuary called a café where people drank coffee and lattes, ate muffins and scones, and thought and talked about intelligent things, like would Henry David Thoreau have written more about throwing up in Walden Pond had he hung out with Charles Bukowski. Indy: But what does this have to do with me? Marcus: Legend has it that the awesome power that gave rise to this intellectual conversation was in the scones! Your old friend Belloq is intent on being the first to discover the Lost Café at Borders, acquire the wisdom of the scones, and use it to clone Hitler, but this time with a much better mustache! We next see a map plotting Indy’s route by car from Marshall College in Western PA to Bala-Cynwyd PA where one of the Borders is reputed to have been located. The route stops in Altoona PA where Indy purchases a Slurpee from Seven Eleven and then proceeds to Bala-Cynwyd. Sallah: Indy! I knew you’d be here. Look, Belloq’s got full excavation going already! And Marion’s here now too. Sallah: No, that’s two people, Indy, one named Marion and one named Belloq. Not Marion Belloq. Indy: What do you know about the Lost Café at Borders, Sallah? Sallah: I know one thing. They are digging in the wrong place! Indy: How can you tell? Sallah: See the two Starbucks Coffee Shops 100 yards apart from each other? 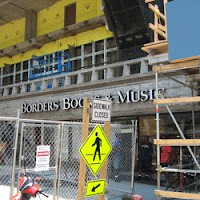 I believe the book store was called Borders because it was usually bordered on both sides by a Starbucks. Belloq, the fool, is digging by the Bed, Bath, & Beyond! Digging a make-shift shaft, Indy lowers himself down into the inner chamber of the ruins of Borders. Sallah: Indy! What do you see? Indy: Books everywhere! Magazines. CDs of all kinds! This would be a great place to browse on a Saturday afternoon! Make a note of that. Sallah: Any snakes down there? Indy: Just Belloq. And he’s got Marion! Belloq: Hello, Dr. Jones. I was in one of the two Starbucks 100 yards apart trying to get Marion drunk on espresso when I heard you underfoot and knew where to dig. And I’ve got the intellectual scones too! Marion: Indy, if he eats one, he’ll be able to make another Hitler, this one with a mustache even bigger than Stalin’s! Belloq: Soon, Dr. Jones, you will see that I have acquired all the wisdom of the Lost Café at Borders! Belloq brings a dry scone to his mouth and makes a face. Belloq: I think I’d rather open a lost ark. 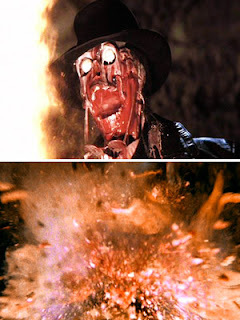 Indy: You think that thing’s dry now, you should have had one when it was fresh! Belloq: Yes, I feel the power of the scones coming over me now, Jones! Sweeping over every pore of my body! It’s beautiful! Marion: Kind of predictable, isn’t he? 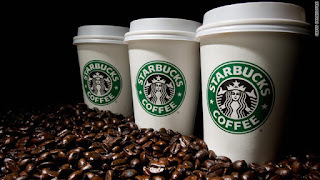 Belloq: Now … If you get your Borders ticket punched five times, you will get a free latte in the cafe! All Joni Mitchell records 50% off with purchase of a cappuccino! Buy three dry scones and take 25% off Jonathan Franzen’s latest book! What is this? This isn’t the wisdom of the Lost Café at Borders! Indy: No, but it is the wisdom of managing the Lost Café at Borders. Belloq: And we have the finest Judaica section in Bala-Cynwyd too! Every book by Elie Wiesel!! And don’t forget Schindler’s List in videos!!! 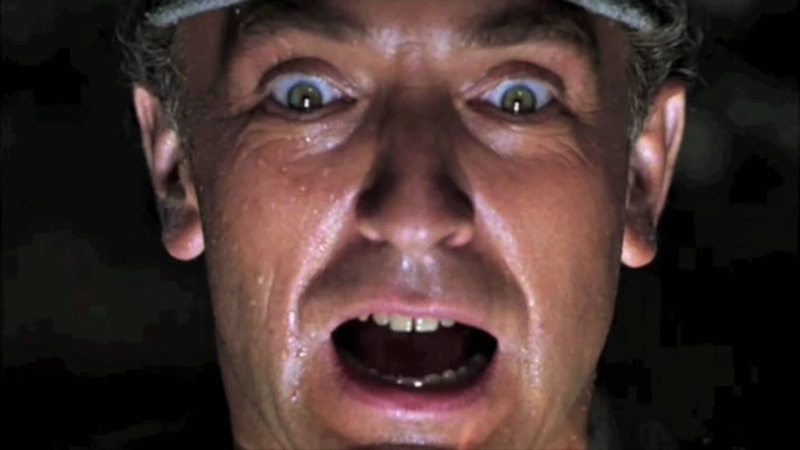 Belloq screams, shrieks something about free wrapping in the mezzanine, and thereupon his head gruesomely explodes. Marion: Shall we take a look at some of the books here before we leave, Indy? Maybe one by E.L. James? 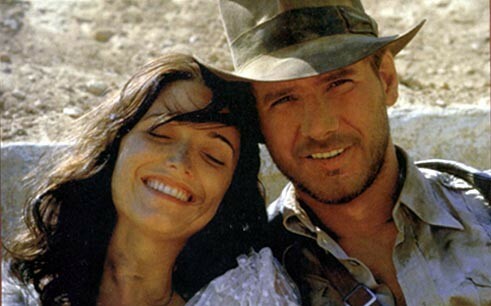 Indy: No, I think we’ve done enough with anachronisms already today, Marion. Marion: Where to next, Indy? Indy: Off to discuss the next Indiana Jones sequel with Steven Spielberg. I’d like to get it wrapped before I’m 80. Those scones sound as dry as a popcorn fart. I think his next sequel should be called "Geriatric Jones and the Search for the Lost Tennis Balls that go on the legs of Walkers." The title is a little long, but don't worry. The audience will be asleep long before the opening credits are done rolling. Asleep? It sounds thrilling next to the Lost Cafe at Borders!